Susan has been packing sardines in one of the places makes very good money. Well Earl, I sure miss you and my many friends in Mason City. But war news is good and maybe we will all get back to normal before too long. Regards to Ruth and your family and Enoch, Rog and the rest. I get my globe and its very fine to keep up with home town news. Tell the Mason City Athletic Dept. not to forget, that Mason City is the home of Champions and to keep up that kind of work. 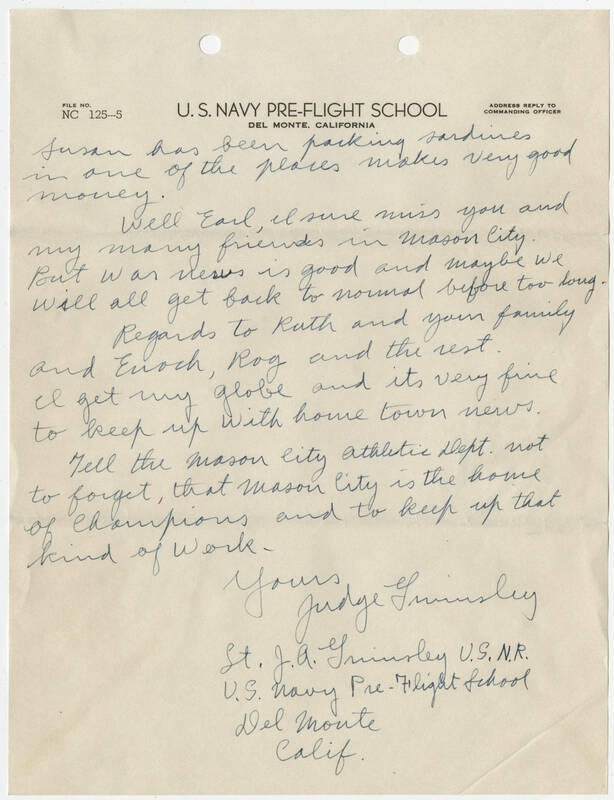 Yours Judge Grimsley U.S.N.R. U. S. Navy Pre-Flight School Del Monte Calif.